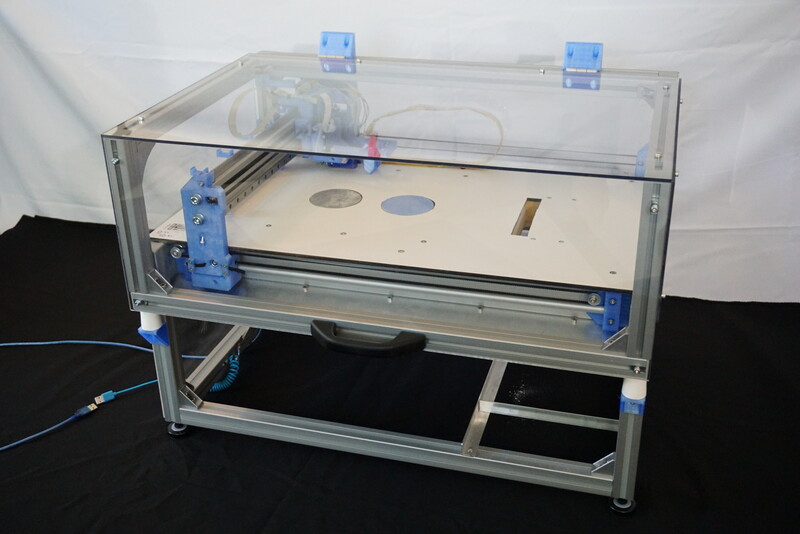 Oasis is an open source 3D powder and inkjet (3DP) prototype printer. It is designed to be a hackable platform to experiment with 3DP. It was entered in the Hackaday prize on Hackaday.io. More information on the actual development can be found there. Oasis is an ongoing project to make 3DP available to makers everywhere. A cover to keep dust out and powder in. (This may seem mundane, but was seriously lacking in my previous printers). A large, flat, unobstructed build area that is easy to clean. (Again, seems mundane, is not mundane). An aluminium extrusion frame where parts can easily be bolted on. Plenty of room for future additions (It should be able to handle 5 printheads or a 200mm cubed print area). The spreader returns and the printer starts at step 1 again. This is repeated until the part is finished. After this printing, the part is allowed some time to dry. It can then be removed from the printer and gently cleaned. After this the part can either receive further processing, or be used directly. You do not need support material. The powder is added one layer at a time, and the powder from the previous layers supports the next layers. All the unprinted powder can be reused infinitely. A wide range of materials can be printed. While FDM is limited to plastics, and SLA requires light sensitive resins, 3DP can print most materials that come as powders. Color can be printed. Because 3DP uses standard inkjet technology, it is possible to add color, simply by printing dye alongside the binder. Powder printing is inherently messy. Very messy. All prints require post processing, ranging from simple cleaning to firing or infiltrating. Untreated parts are often fragile. This also limits maximum size of parts. The part needs to be able to survive post processing. All of the print area needs to be filled with powder. While the excess can be reused, a minimum amount of powder is required to print at all. 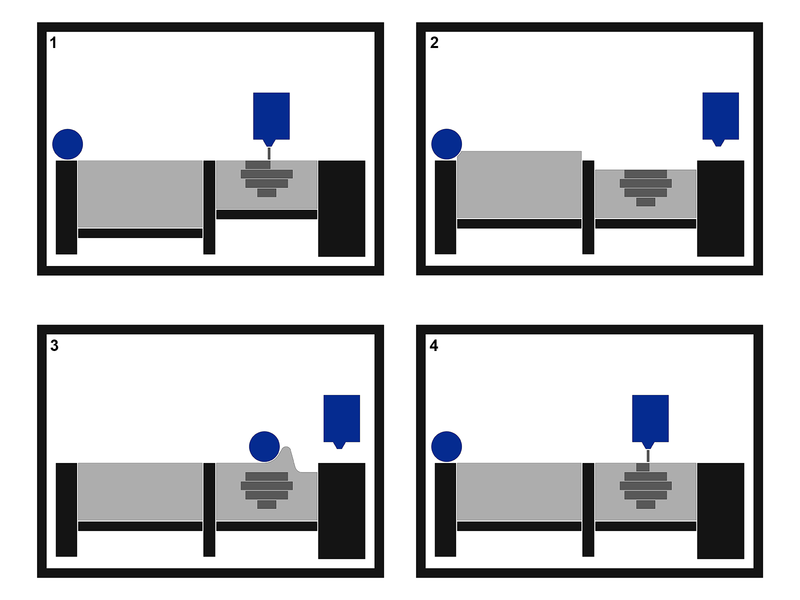 3DP prints only one material at a time. Hollow parts need escape holes to drain unprinted powder. 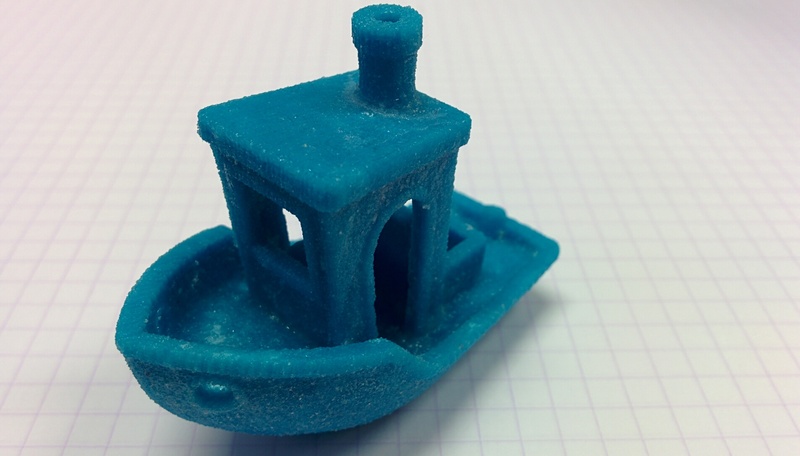 There are a variety of materials 3DP can print. The only thing these materials have in common is that they are powders. In most cases, a glue is added to the powder. Examples of this are PVA, sugar or maltodextrin. The binder is generally an inert liquid, like an alcohol/water mix. I have seen people printing directly with Vodka or Rice wine (Rice wine smells amazing). While I do not posses a full list of possibilities, a range of know materials is provided below. Sand (for sand casting molds). ExOne specializes in this. By printing in types of sand with special binders (Furan, Phenolic and silicate binders are mentioned) you can create detailed sand casting molds that can receive metal without special post processing. Ceramics can be printed by adding glue to the powder. Most of the available information uses maltodextrin and powdered sugar to make the ceramic powder printable (most recipes 4-1-1 ceramic, sugar, malto). A 10%-20% alcohol/water based binder is then used to bind the part. 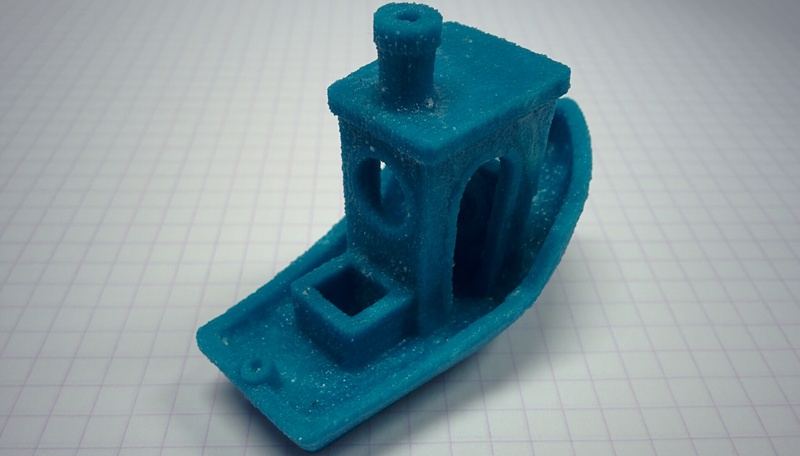 A site called open 3DP (university of Washington) has some great potential recipes, not only in ceramics. Check the site out if you have time. Powdered Sugar was revealed by a company called ‘The Sugar Lab’ around 2013, but was almost instantly bought by 3D systems. It now lives on as Chefjet. Exact details of how to print sugar are not known, but I suspect printing in pure sugar with water/alcohol should already somewhat work. I will investigate. Right now the Hackaday.io page linked here will give the best guide. Once I have worked more on Oasis, I might add a better guide here. For specific questions you can always try the contact me page. The project described on this page is licensed under the Creative commons – Attribution – ShareAlike license.